Salesforce which is touted as the top-notch cloud-based CRM platform caters to organizations with an engagement layer that steps beyond consumer expectations across sales, marketing and service. Sound cross-cloud solutions that are incorporated through all-inclusive enterprise digital value chain, can drive enormous value from the formerly untouched areas of a business. Salesforce helps organizations grow their productivity and conversions while facilitating a better understanding of customer’s personal preferences. It also aids in helping customers by catering access to past customer interactions, identifying new opportunities by examining the best customer purchase histories. AIMDek is positioned to cater end-to-end Salesforce services with faster time-to-market roll outs at minimal operational costs while ensuring you get a tactical package evaluation and roadmap, robust implementations and rollouts, product development and support and build exceptional customer experiences. We can be your Salesforce consulting partner who can map out a comprehensive and conducive CRM roadmap for optimal implementations. We cover all your consulting needs from strategizing and development to deployment and support. Align your unique business models to facilitate faster and efficient sales management and acquisition with our agile Salesforce development and deployment approach which further helps you streamline business operations, increase ROI and customer engagements. 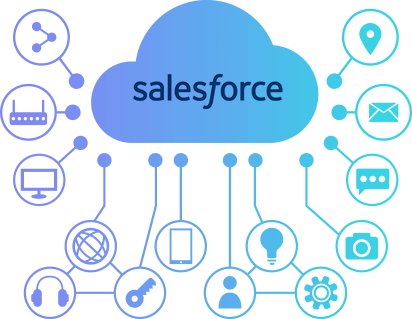 Our Salesforce integration offerings ensure seamless integration of Salesforce in all your existing systems to produce new levels of efficiency and productivity in your business processes by cutting down churn and promoting cross-sales opportunities and referrals. With our Salesforce migration services, we help you successfully migrate to Salesforce sales from any third-party applications ensuring data integrity to be intact, uncompromised, consistent while eliminating duplicity. Service your customers efficiently and quickly. With our Salesforce support services, we aid our client migrate their inward bound call centers, customer service and technical support to service cloud as per defined SLAs. Sell, market and service by leveraging the full potential of the best CRM- Salesforce by scoping a project in it with us.